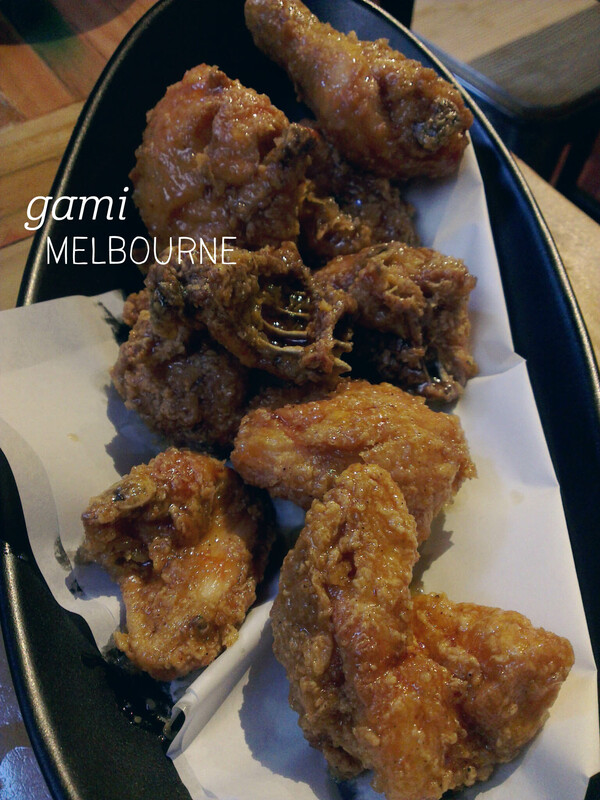 No-one warned us that Gami sells their Korean fried chicken by the whole chook. Seriously. We spent a good minute freaking out before seeing the smaller serves (phew!). Mum and I were hurriedly shown to a table upstairs, where we were ignored for quite a while before having our order taken. Yes it was busy, but the vibe wasn’t exactly customer-friendly. We ordered the half chicken ($18) with soy garlic sauce plus a kimchi pancake ($14) (because I have no willpower). We snacked on the complimentary pickles until the pancake arrived – it was perfect, with just the right amount of spice and a great dipping sauce. Yum, yum, yum. The chicken came out not long after, with 9 pieces (assorted cuts). My first impression was that the sauce may have let the dish down – it left some of the skin soggy rather than crispy, taking away the contrast with the tender meat within. However, it was sweet (honey-like), and so moreish. On the downside, the chicken was very oily and also quite salty. I would give them another try as you can order the chicken without sauce, but I was disappointed by the service and the ‘churn them through’ vibe, so it’s probably not at the top of my ‘to revisit’ list. My dream has come true. There is an authentic Japanese izakaya in Australia. 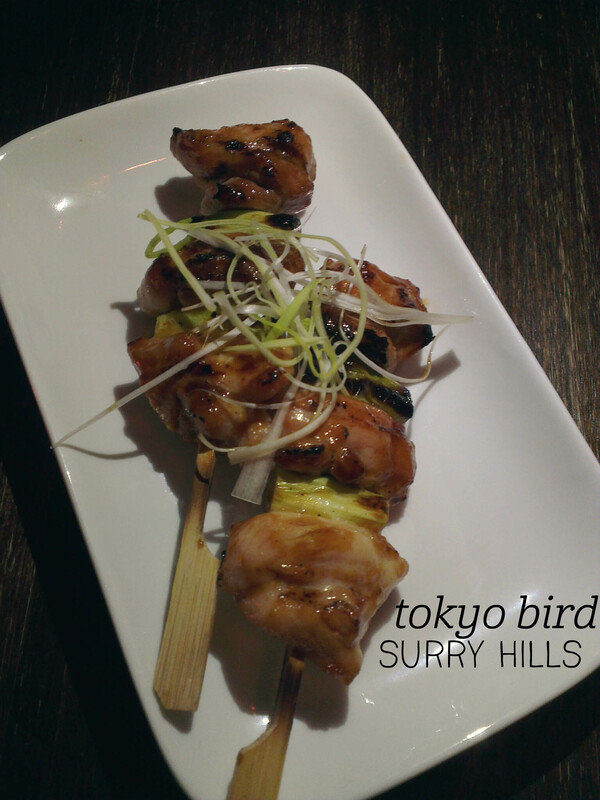 Tokyo Bird sits in a little Surry Hills laneway and fulfills all my izakaya needs – an extensive drinks menu, lots of ‘little bites’ to eat and a vibe that’s buzzing. We started with cocktails – I chose the Breakfast Martini, with gin, curacao, lemon and yuzu marmalade. There is so much citrus happening there that my cheeks puckered, definitely in a good way. Dinner started with the Assorted Pickles ($6) and Katsu Chicken Nuggets ($9). The pickles were lightly done and dusted in spicy togarashi seasoning – excellent for nibbling slowly. 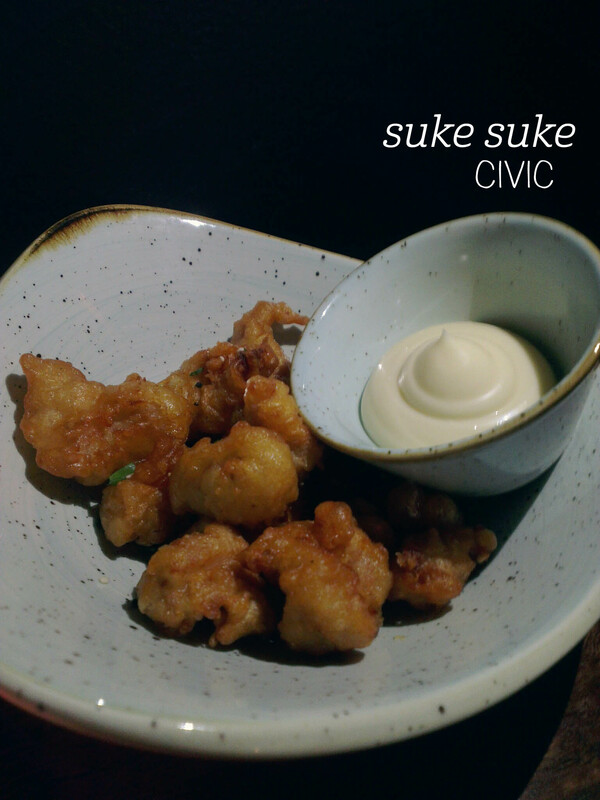 The katsu nuggets were the best thing ever – tender chicken bits deep fried in panko and served with kewpie mayo. Needless to say, they disappeared very quickly. We then picked four yakitori dishes. I loved the Negima (chicken thigh with shallot) – tender, charred nicely and basted in the magic yakitori sauce, it was probably my favourite of the four. The Tonton (pork belly) was lovely and fatty, and the Hatsu (chicken hearts) were tasty, although slightly tougher than the other meats. Finally, we both loved the Nasu (eggplant and miso) – beautifully salty with creamy eggplant, we were in izakaya heaven. I will be back as soon as I possibly can! Sometimes you just need… ha! Thought I was going to say ‘a burger’, didn’t you? No, this time I acknowledge that there is indeed a time and a place for KFC. Korean fried chicken, obviously. 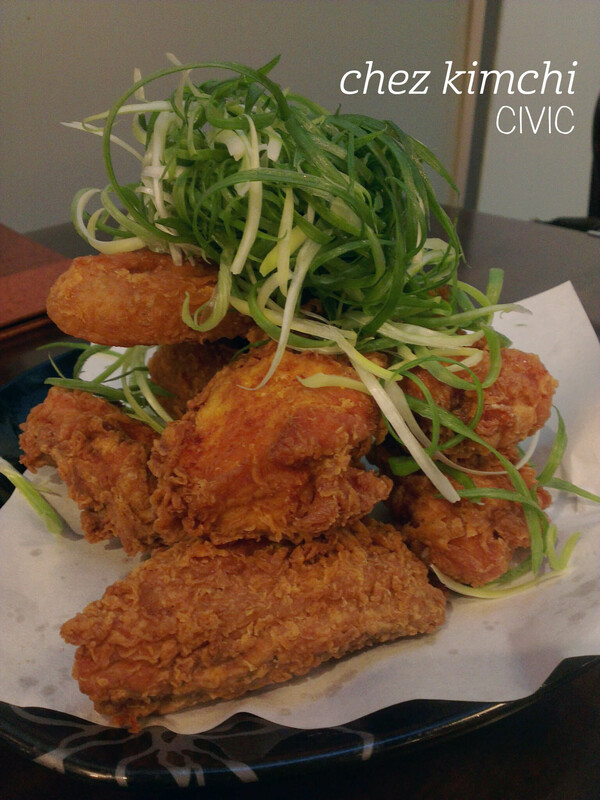 A friend and I caught up for KFC at Chez Kimchi on a Friday night, getting a table without a problem. We started with iced apricot tea – served in a large glass it was beautifully refreshing, and kept us going until our first dish arrived. Hello kimchi and pork dumplings! Wrapped into perfect little rings, the serve of 4 ($6.80) was a perfect starter for two. We loved the spicy kick of the kimchi and enjoyed trying the dipping sauces provided. I was also a bit enthusiastic about the pickle sides – so, so good. The main event was the half-size fried chicken. Curious to see what the wasabi sauce was like, we picked the Spring Onion Chicken ($18), which had 7 pieces of chicken (so tricky to split, but we managed). Unfortunately we didn’t get any wasabi sauce with it, but the chicken was so perfectly crispy and delicious that we didn’t really mind. The food here is such great value too – definitely one to come back to. 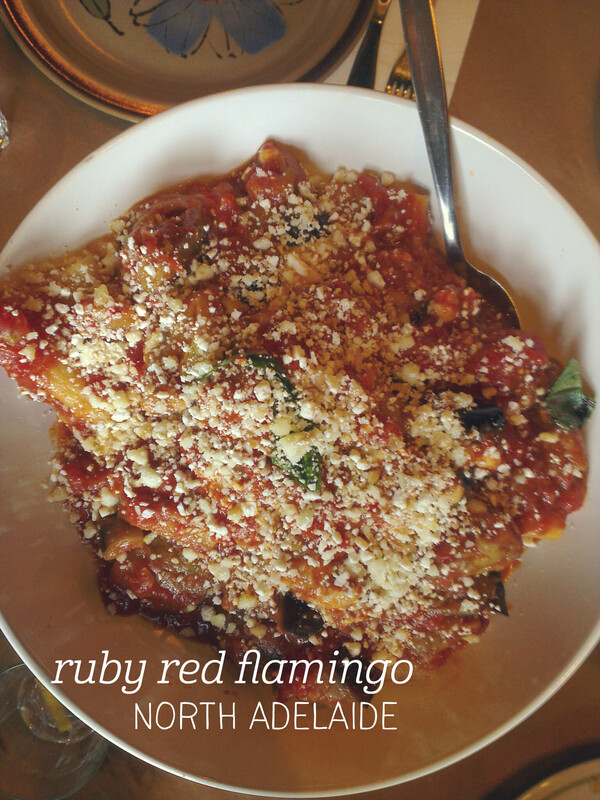 Ruby Red Flamingo (RRF) is a lovely hideaway in North Adelaide and was packed out when we went on a Friday night. The staff here are really friendly and welcoming! I started with a mocktail, the Cicciolina, with pineapple, orange, lemon and soda, packed with fresh orange, lemon and lime wedges for extra freshness. Dish one was the beetroot cured salmon carpaccio; elegant and fresh, although I would have liked a stronger salmon flavour. The fresh fennel on top went well. Things only got better with dish two – the BEST ARANCINI I’VE EVER HAD. Seriously. The perfect balance between crisp, moist, tasty, cheesy and with a really moreish flavour combination. Please go and eat many, many of these for me. Next up was the utterly heavenly eggplant pasta – thick, flat tubular pasta doused in a rich tomato-based sauce with perfectly-cooked pillows of eggplant throughout, and plenty of parmesan for bite. The only thing that could have made this better was some kalamata olives, for a salty boost. Last up was the whole chicken, splayed and served with amazing roast veggies. The chicken was tender and succulent, whilst the veggies (especially the potatoes) were super tasty. I know I over-ate, but when the food’s this good, I dare you to try and stop! So… I may or may not have ordered the burger. Again. To start, I ordered a green apple, pineapple, lime and mint juice ($7.50), which came out in a large glass – the pineapple wasn’t too sharp and the lime was just a light hint, although I couldn’t really taste the mint. 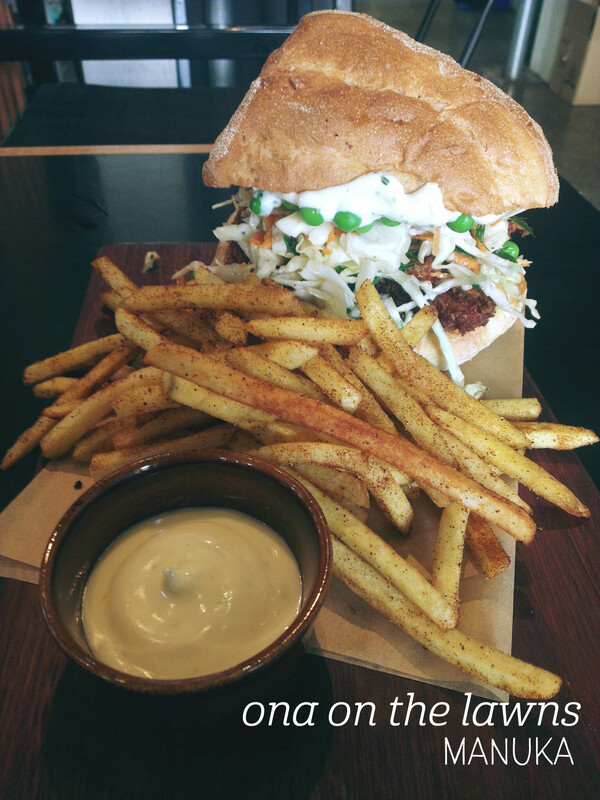 I couldn’t go past the buttermilk chicken burger ($20), and I was wowed by the piled-high stack that came out with fries on a board. The fries were amazing, with some sort of magical seasoning (mmm) and a herbed aioli that was just perfect. I wasn’t sure how to eat the burger, so I ended up pulling it apart – there was a whole lot of cabbage ‘slaw packed into the bun, with a tonne of runaway peas sandwiched into the upper half of the bread. Given the board was so full, I found it quite hard to eat, but everything was super tasty – I loved the mayonnaise spiked with sprigs of dill, and the chicken was beautifully tender inside the crisp buttermilk shell. It was hard to get a sense of the flavours all together, but I did enjoy the more unusual ingredient mix, and would highly recommend the fries. This is a public service announcement – Smoque offers 50c wings (yes, you read that right, 50c wings) on Monday nights for dine-in customers. Cue marching band celebratory music here. Three of us headed down to the Woden store after work to indulge – we ordered 25 wings, sides of Mexican street corn and coleslaw, and a plate of poutine (chips with gravy and curd). It was a merry feast, although my friend picked the spicy (not suicidal) wings and as much as I wanted to eat more I couldn’t – clever tactic dude, clever. The wings were freshly cooked and had a nice amount of batter without being super oily. I avoided the blue cheese dipping sauce but apparently it was great, and there were some carrot and celery sticks served with it too. The chicken was tender and fell easily off the bone – so good. The corn was a highlight, fresh and covered in delicious cheese and sauce and a bit of lime, it was a nice break from all the meat. 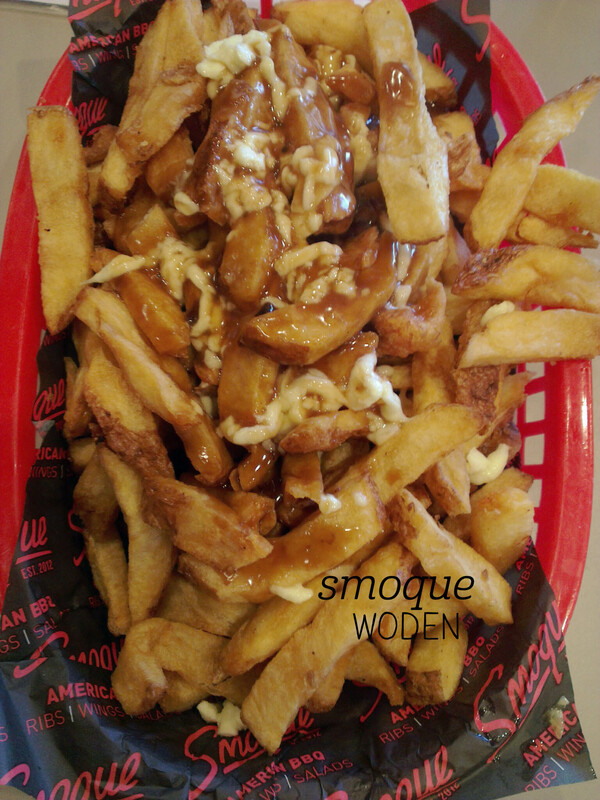 The poutine was my favourite though – the chips were really tasty (must be made from flavoursome potatoes), and whilst I would have liked more gravy, it filled me up after I couldn’t eat any more spicy wings. Next time I’ll be getting the non-spicy ones and smashing plenty more!